A leaked report in September 2014 from the UN Intergovernmental Panel on Climate Change (IPCC) tells us that global warming is here, likely irreversible, caused by us and probably already dangerous. It is currently in the hands of the Irish Government for comment. One of those same hands though has delayed, yet again, the introduction of the proposed Climate Change and Low Carbon Development Bill because it is not on the priority list of legislation being moved by the Coalition. How can the Government square this stagnant position (given the importance of agriculture to the Irish economy) with the IPCC statements that climate change will worsen violent conflicts, increase refugee problems and impact on efforts to grow more food in a secure and sustainable manner? The fact remains that we are all currently looking forward to a +4 C world by about the year 2060 with the year 2030 as a tipping point. And Ireland still waits for a legislative lead on what its exact plans are. Just saying that GreenHouse Gas (GHG) emissions will be reduced is not sufficient at this time. After all the well-known Irish scientist John Tyndall predicted in the 1860s that infrared radiation would become trapped in the atmosphere by some of the gases (like carbon dioxide, methane and ozone) released from planet Earth. Then in the 1890s the Swedish chemist Svante Arrhenius calculated that for a doubling of carbon dioxide in the air (to about 560 ppmv) our climate would change by about +5 to +6 C. That is a temperature change not far from the +4 C levels which we are currently predicting 120 years later….and after spending millions of dollars, euro and pounds. For perspective, in April 2014 the mixing ratio (concentration) of carbon dioxide in our atmosphere reached 402 ppmv, which represents the highest level recorded in at least 800,000 years. How have we got to here? The initial design of planet Earth’s atmosphere appears naturally simple and beautiful. Plants take in carbon dioxide alongside water, and with the help of the Sun (our own nuclear fusion reactor that’s on average 150,000,000 km or 93,000,000 miles away) make food/energy and also oxygen. Humans and animals take up both of these products in order to live and by the process of respiration breathe out carbon dioxide (CO2). Then the cycle can begin again. Actually that interaction between oxygen, sunlight, water, plant life, carbon dioxide and humans in pre-industrial times led to a planet that consisted eventually of just the right proportion of oxygen, about 21%, to allow us to thrive. The level of carbon dioxide at about 280 parts per million by volume (ppmv) along with water vapour acted like a knitted comfort blanket in our atmosphere to keep us nice and warm but not too hot because the blanket had a few holes in it to prevent overheating. This working cycle was thrown out of balance by the Industrial Revolution beginning in the 18th century, particularly when we began to mine and burn the fossil/carbon fuels developed over the Earth’s lifetime by plants dying and decaying into the ground. Those activities released a number of gases that filled in some of the holes in the blanket and also added to its thickness. The leaked IPCC report represents a synthesis of three major reports published over the last year that covered: the Physical Science Basis for Global Warming; Impacts, Adaptation and Vulnerability; Mitigation of Climate Change. From their conclusions it is clear that Plan A for the world is not working because we fundamentally seem unable to wean ourselves sufficiently from an addictive dependency to burn carbon as the main fuel for our energy requirements. Individuals should ask themselves if they ever use coal, peat or wood to heat their homes? And also ask if their houses have solar panels? Individual governments must also begin to step up to the mark with their own working strategies and detailed plans…they need to do it now and not prevaricate for short-term, re-election concerns. 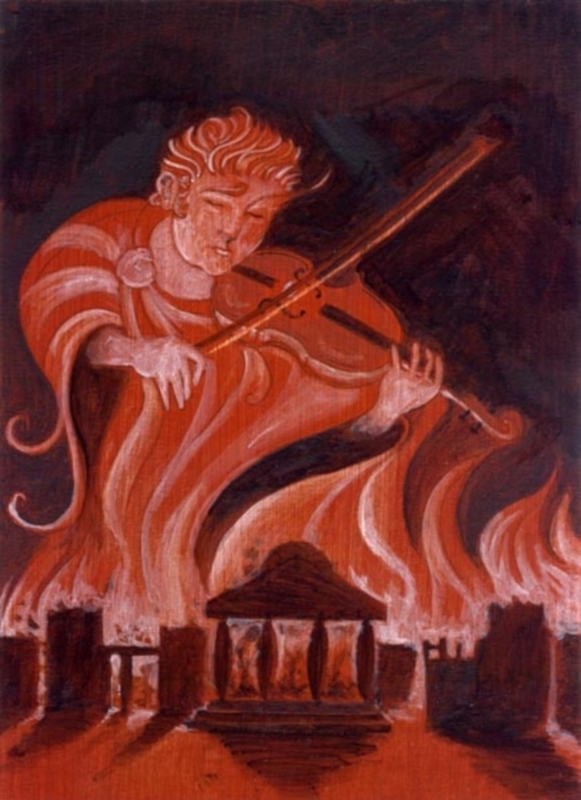 My title for this blog is provocative and is meant to remind us of the rumour that Emperor Nero was content to play the lyre while Rome burned in the Great Fire of 64AD. But are we really willing to sit back and do insufficient because of selfish, national economic predictions when Greenland might melt and the Amazon region could collapse? When clean water and food supplies would be affected everywhere. And when we would experience many more extreme weather events. Worst of all would the world (including Green, underpopulated Ireland) be able to cope with many millions of environmental refugees who would become permanently displaced because their countries would be submerged under water…like Atlantis. So does the world have a Plan B? Well a modified Plan A to utilize a cycle in which natural biomass feeds industry that then releases carbon dioxide which is then taken back up by replacement biomass is likely to be one part, perhaps small, of the answer. But there are associated issues with land grabs, food price rises and particulate air pollution needing to be addressed. This game though is at least a balanced zero-sum. One part of Plan B, outlined by the UN report, breaks that cycle though by using carbon dioxide to help grow biomass that is harvested and utilized by industry. Then the CO2 emissions are captured from our atmosphere and sequestered (pumped away) into geological reservoirs. Unfortunately this type of GeoEngineering is untested on a large scale and to some appears counter-intuitive….burn a tree to save our planet? What happens to underground leakages? Are there any toxic side-products in the processing required? Would there be even more land grabs and food shortages because of the approach? Plan B also includes the use of renewables like hydroelectric power, wind power and solar energy. But truly large sums of immediate investment (including for basic research) are required to grow this strand…although it must be regarded as worth it in our current situation. As does the use of nuclear power, it is after all our current main energy source, although the Sun is not in our own backyard! Even those who will never believe that climate change exists should welcome Plan B with open arms. It may represent our 21st century equivalent to the Industrial Revolution. An Environmental Revolution is nothing to fear. On the contrary it might be just the action we need to kick-start the world’s economy. Do we need a Plan C? With government inaction Plan C might be imposed on planet Earth. There is an almost perfect correlation between increases in population numbers, our energy requirements and carbon dioxide levels in our atmosphere. A +5 C or +6 C or a +7 C world might lead to War, Plague and Famine. Then the problem would be solved.